Known as 'The Pearl of the Danube Bend'. 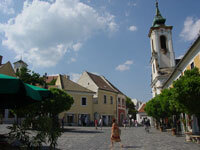 Szentendre is a quaint old market town situated on the slopes of the Pilis Mountains. Meandering cobbled lanes, little squares, red-tiled roofs, brightly painted houses, and Orthodox churches give it a charming and artistically picturesque setting. Serbian refugees inhabited the town in medieval times and their style contributed to the charisma of the town's haphazard structure and Balkan flavour. Numerous Serbian churches add to the collection of historical buildings. In the 1900s, the town became a favourite retreat for painters and sculptors, resulting in a wealth of museums and art collections scattered among the tourist souvenir and handicraft shops. Being close to Budapest, the town is a popular excursion from the capital and has become one of the hotspots for tourism in the country. Be warned though, summer weekends can get rather overcrowded.